Lab Unlimited is the leading supplier of Lab equipment, Lab consumables, Chromatography instrumentation and Chromatography consumables as well as Environmental monitoring and testing supplies. We offer a wide range of high quality products which we source from a wide network of reputable manufacturers to ensure that we can provide you with a complete solution for your lab needs. One-day conference to examine how DNA technology is evolving and impacting on a range of sectors, providing critical information on the genetic code of humans, animals and microorganisms. 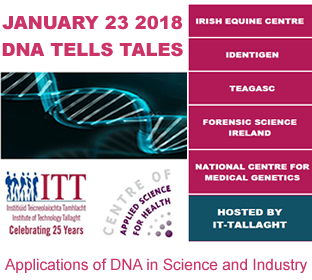 Today, IT-Tallaght will be hosting a one-day conference to examine how DNA technology is evolving and impacting on a range of sectors, providing critical information on the genetic code of humans, animals and microorganisms. The laboratory glassware washers/disinfectors from Miele are your professional ally for cleaning all your lab glassware. Very gentle on materials, the Miele brand is recommended by the leading glassware manufacturers worldwide. Meet the Dissoclean: an in-place vessel cleaner that saves you time & money! Very versatile and cost-effective, the DV2T and the DV3T are all-rounder instruments for measuring viscosity. They are the perfect choice for any research, development, and process labs - for which viscometers are key! Unmatched Accuracy & Precision: The Microlab 600 is a semi-automated highly precise syringe pump with a graphical user interface that allows for quick & easy dilution and dispensing of liquids. It increases throughput and consistency while reducing cost and wasted buffer. DURAN®TILT is designed for making work in biosafety cabinets and clean hoods safer and easier. Lab Unlimited is pleased to announce the return of its one day, practical seminar on Rheology & Viscosity Methodology - Thursday | 1st December | Lab Unlimited head office in Dublin. Presented in partnership with Brookfield Ametek, a leading supplier of precision viscosity instrumentation, this seminar has been specially designed with viscometer operators, including R&D lab technicians, production personnel, process engineers/scientists and QC technicians in mind. Scientific Industries have developed the Rotator Genie™ as an ideal "All Weather" rotary shaker as it is designed for both cold room and incubator use. The HSE have issued guidelines to help employers select the right type of protective glove for their particular situation.